1000 Baht type 1 with the title "promise to pay"
1000 Baht type 2 the title was change to "banknote is legal tender"
Type 1 ordinary number signature Supayok VF about 94,000 - 100,000 baht. Type 1 ordinary number signature Supayok F about 59,000 - 62,000 baht. Type 1 ordinary number signature Komarakul VF about 83,000 - 87,000 baht. Type 1 ordinary number signature Komarakul F about 57,800 - 60,700 baht. Type 2 ordinary number signature Chaiyyos VF about 61,500 - 64,500 baht. 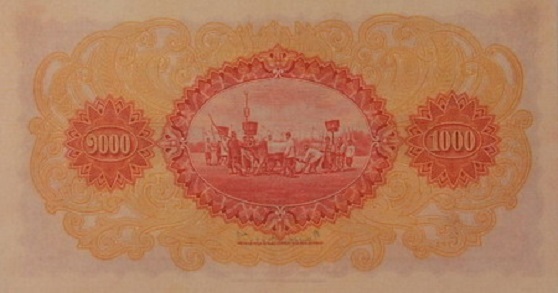 At the beginning the 1000 baht banknotes were print with the title "Promise to pay to bearer on request in Siamese currency" that comply to the current currency act. Then the Temporary Currency Act was announced in 1918 to cancel the right to pay. 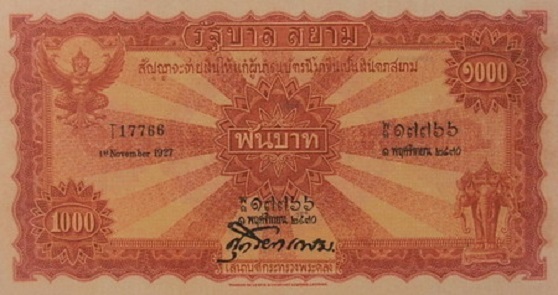 The 2nd series 1000 Baht type 1 banknotes were announced on 15th July 1928. 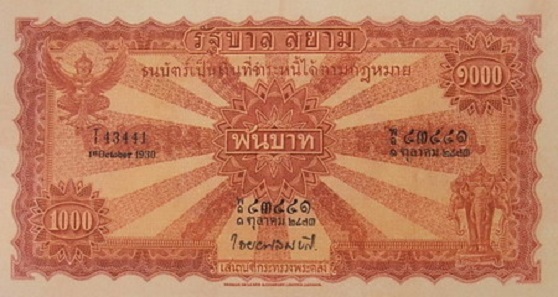 The 2nd series 1000 Baht type 2 banknotes were announced on 19th Febrauary 1928.